Muslims nowadays are in dire need of understanding this concept. We must firmly believe that despite our current weakness, Islam will prevail and be victorious. This concept gives hope to the hearts of the believers, especially when one reads the saying of the Prophet sallallaahu `alayhi wa sallam ( may Allah exalt his mention ): “A group from (among) my nation will continue to be upon the truth supported by Allah; they will continue to fight Jihad until the advent of the Hour.” We ask Allah to make us from them. Where do the Muslims of our era stand in terms of this divine command? They have disunited and become scattered groups, to the point that the common Muslims cannot recognise where the truth is anymore. How can the Muslims unite? What will unite them? The only thing that will unite them is their collectively holding on to the Bond of Allah, His Book (i.e. the Quran), His commands, and His religion. Any attempt to unite on any basis other than the religion of Allah will be fruitless and people will not attain the sought victory, because Allah only aids those who unite on the basis of His religion. The concept of superiority: Allah Says (which means): “You are the best nation produced [as an example] for mankind. You enjoin what is right and forbid what is wrong and believe in Allah…” [Quran 3: 110] How did our nation become the finest and most superior? It was through it enjoining good and forbidding evil. If we fail to do this then we can no longer count ourselves as a part of this superior nation as this superiority is not granted simply for being a member of this nation. Rather, we must fulfil the conditions of being superior. 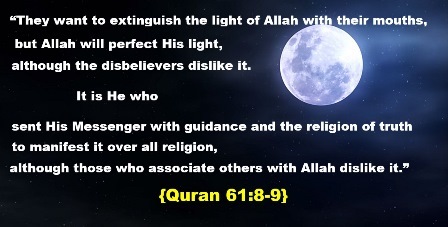 This superiority is mentioned in different verses to reflect another concept; Allah Says (what means): “So do not weaken and do not grieve, and you will be superior if you are [true] believers.” [Quran 3: 139] Meaning that we are superior when we adhere to our religion and its teachings; we are superior with the faith that Allah blessed us with; we are superior due to our adhering to the Sunnah of our Prophet sallallaahu `alayhi wa sallam ( may Allah exalt his mention ); we are superior by persevering in our adherence to the Quran and the Sunnah. The concept of not being attached to individuals: One must not be attached to individuals, regardless who they are. Instead one must attach himself to the religion only, because those attached to individuals usually give up their convictions with the death of the ones to whom they are attached, while those attached to the religion remain steadfast even with the deaths of those who introduced the religion to them and whom they love dearly; Allah Says (what means): “Muhammad is not but a messenger. [Other] messengers have passed on before him. So if he was to die or be killed, would you turn back on your heels [to unbelief]?...” [Quran 3: 144] If this is regarding the Prophet sallallaahu `alayhi wa sallam ( may Allah exalt his mention ) then it is certainly more applicable with respect to anyone else. The concept of having to face harm from the disbelievers: We must realise that the disbelievers will afflict us with numerous and varied types of harm; Allah Says (what means): “You will certainly be tested in your possessions and in yourselves. And you will surely hear from those who were given the Scripture before you and from those who associate others with Allah much abuse. But if you are patient and fear Allah – indeed, that is of the matters [worthy] of determination.” [Quran 3: 186] Therefore, the harm that they afflict us with is physical, financial and psychological, but what is the cure and way out? Allah gives us the cure at the conclusion of the verse, namely, perseverance and piety. If we do not have these then we will not be able to stand their afflictions, nor will we be able to confront them. Finally, the solution for all our problems is found in the Quran and all we need to do is to adhere to it, correctly understand the concepts in it, and apply them and inculcate them in practical life.